Secure the Rebound! Go up after the ball and pull it down with both hands! Increase gripping strength when rebounding the ball! 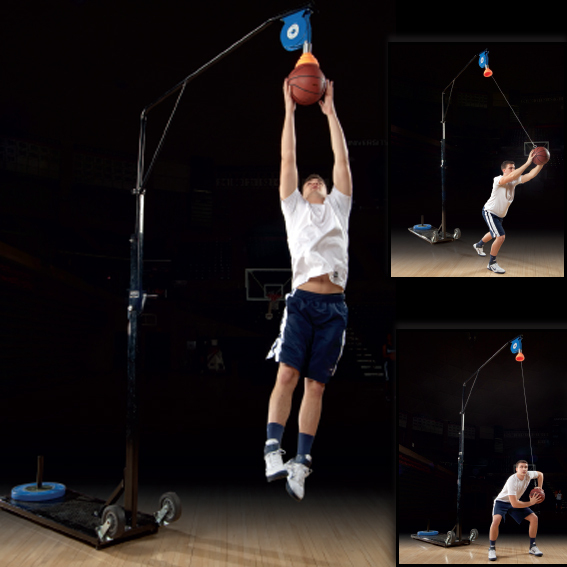 Adjustable: Turn hand crank to lift or lower the height of the ball from 8’ to 12’ high! Built in tape measure allows precise height settings! Non-marking front wheels allow the unit to be tilted forward and rolled off the basketball floor quickly and easily! Spring loaded retracting cable resets the ball after it’s released. The ball nests in a rubber cup holder. Cable tension can be adjusted to increase or decrease the pull down resistance of the ball! The platform rests on rubber bumpers so it won’t scratch or mar a basketball floor. Add Olympic plates for extra weight and stability! Basketball included: Official size basketball filled with polyurethane foam. Wall mounted option available.